Gah! This weekend. I love these two so much. I got to spend so much time with them over the last year and honestly I was sad when the wedding was over because we didn’t have anything else planned together. Now I’ll be patiently waiting for them to return to STJ for their anniversary. BUT for their wedding weekend, they kicked it off with the welcome party at Drink, getting to hang with all of their guests by the water. On their wedding day, we hung out at Sirenusa while they got ready, and spent quality time with their families. From there we had their first look at Hawksnest on their own little private part of the beach followed by their ceremony up at Susannaberg. This location you guys. It’s so cool. 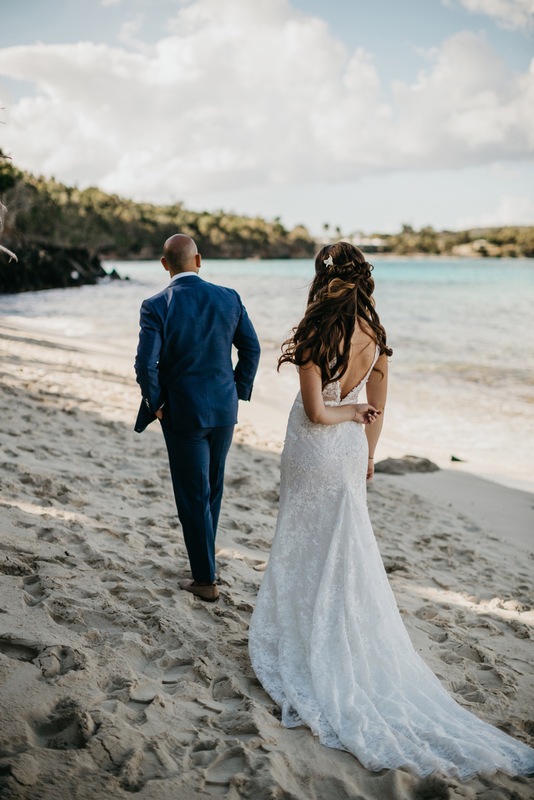 Sitting on the top of a hill with a beautiful view of the ocean and the surrounding islands, and next to an old sugar mill, they tied the knot with their closest people. Then we all made it back for sunset at Susannaberg for all the drinks and good food and speeches and a solid dance party under the string lights. It was such a beautiful day, and these two stopped feeling like clients a long time ago, they’re good friends. They even adopted a little nugget pup from the shelter here and brought him home with them .. starting their little family. I meannnn.. I love them. Check it out my people..